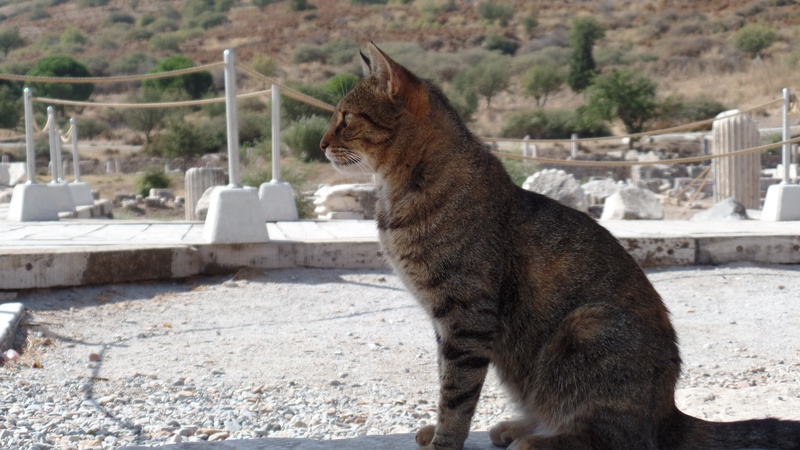 Ephesus Cat, who blended right into the ruins! this lodging–there is a lovely pool, lots of outdoor communal visiting areas and the nightly fee includes both breakfast and dinner. We also met some truly excellent fellow travelers while there: Catherine from Canada, Kristof from Belgium, and Beate and Achim from Germany. We had great conversations with these people, and swapped contact info to keep in touch. There were hugs and handshakes all around when we left this morning. 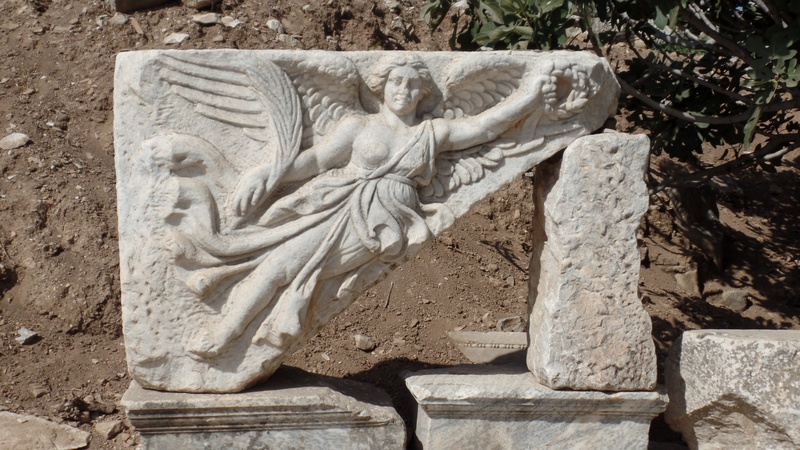 Yesterday Thomas, Catherine and I walked from Atilla’s to the entry of the Efes ruins. We were three among thousands of visitors on a hot, hot, hot sunny Sunday. We walked for miles over the course of the day, with Thomas being extra tough and going up to a lookout point that Catherine and I decided to skip. 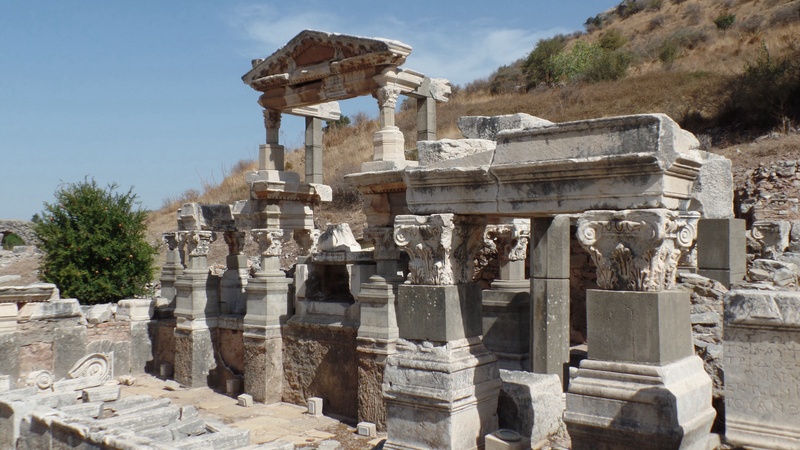 The crowds of people were at times overwhelming, but it was still a very wonderful day of learning and exploring the biblical history of Efes. 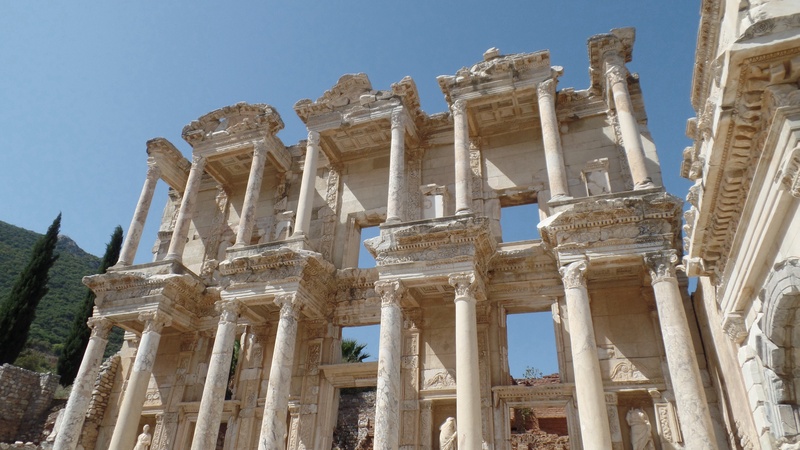 While all the sections of Efes were amazing, I found the Library of Celsus and the Church of St. Mary to be most awe-inspiring. Some of the reconstructed ruins. After Efes we went back into Selcuk and had lunch, then returned to Atilla’s to swim, read and relax before sitting down to dinner with all the other guests. We had some wonderful conversations about spirituality, travel, philosophy and human connection. It was a really nice way to end such a great day. Today we are traveling by train to Pamukkale, where we will stay until Wednesday. And from there we are thinking it might be time to head to Greece. 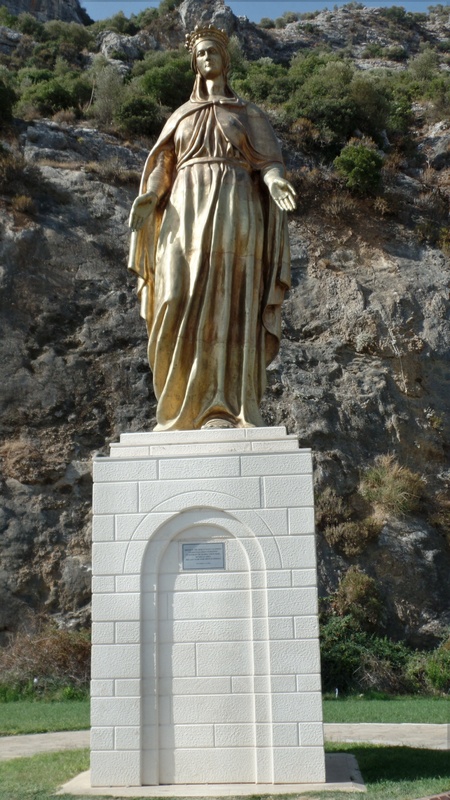 We may start the Greece leg of our trip on Kos, but are open to other suggestions from those who are move familiar with Greece than we are. Cheers til next time, friends! What’s your sense about an older woman traveling alone in Turkey? Chava, we have see a few single women traveling without any major concerns. My perception of Turkish people and businesses is that they want to help guests, regardless of age or gender :). So come on over here, dear lady! Sounds like you’re having the perfect combination of elements. Glad you’re meeting other good folks. Wishing you continued good experiences. Can you believe it’s been almost 2 weeks? Can’t believe we are already two weeks in to this trip–we still haven’t finished with all the places in Turkey we want to see, but are trying to ‘let go’ of some places in order to leave for Greece. Hope you are well, sweet Mom :). Talk to you tomorrow, yes?